Window condensation is more than annoying. The moisture that forms on window panes and blocks your view can also damage plaster and molding. Here are some things you can do to minimize condensation. If your home or workplace is too humid, you might see fogging or excessive moisture buildup on your windows, or possibly in the space between double- or triple-pane windows. If this is the case, you can take measures to reduce the humidity inside the building. Either turn down your humidifier a notch or consider getting a dehumidifier. Even a mini-dehumidifier can make a difference. Do you have a lot of plants near your windows? While having indoor plants is a great way to bring nature indoors and improve your indoor air quality, consider the placement of your plants. If too many are grouped together by windows that frequently exhibit condensation buildup, consider redistributing your plants, moving some to other rooms, or at least making sure they’re not so close to your windows. Another great way to keep window condensation at bay is to improve air flow in the problematic rooms. Open some windows if the outside temperatures allow you to do so. Bring a portable fan into the room. Turn on the bathroom and kitchen fans, especially when you’re bathing or showering, or when you’ve got a lot of pots boiling on the kitchen stove. If you see condensation between the glass, there’s likely an issue with the seal. You may be able to have your windows professionally re-sealed, but depending on the type of window you have, it may be more cost effective to replace it. If your clothes dryer or gas burners don’t already vent outdoors, it’s a good idea to have this remedied. 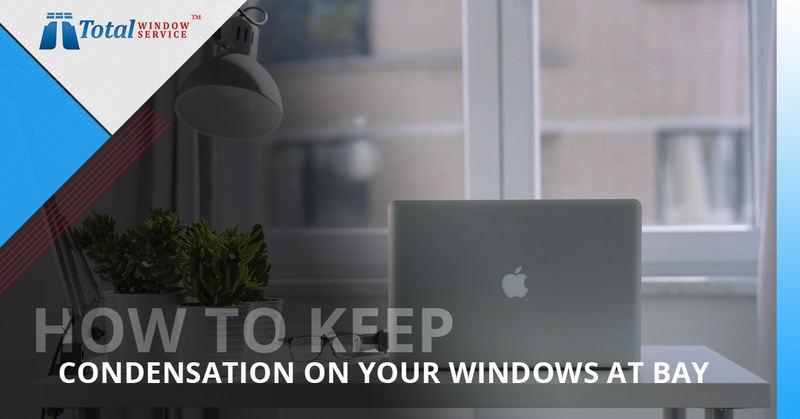 You’ll enjoy a higher indoor air quality, and your windows won’t experience as much condensation. Check your attic vents as well; they should be fully open to encourage air flow. If you’re experiencing any types of problems with your windows, including excessive condensation, contact Total Window Service. We are located in New York City, and we offer complete window cleaning and restoration services throughout the region. Turn to us if you need window glass repair, graffiti removal, or any commercial or residential window cleaning services. We’re here to take care of all your window washing and restoration needs. Call us for a quote today!